Hey friends! 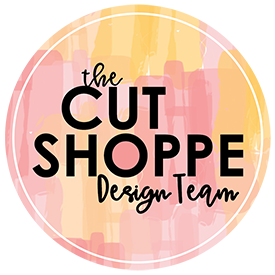 I’m back today to share a layout I recently created for The Cut Shoppe using the Pretty Pottery Cut File. I cut the intricate cut file on white cardstock and used Patterned Paper #5 from the Pink Paislee Paige Evans Whimsical Collection to back the cut file. I love that I was able to get a wide variety of colors by just using the one paper! It saved so much time by not have to fussy cut each individual area with multiple patterned papers. I added multiple Chipboard Thicker Icons, Puffy Stickers, flowers from the Sticker Book, Enamel Shapes and Floral Die Cuts around the layout. I wanted to get as much color and texture as I possible could. <<< I think I achieved this goal! HA! For my title, I grabbed the word “Artistic” from the Whimsical Die Cut Pack and letters from the Whimsical Alpha Chipboard Thickers to spell out the word “Cat”. This layout is all about how my cat LOVES my craft room. I’d say she spends 75% of her day in my craft room. She loves sleeping on my chair, looking out the windows, batting things off my desk, and walking across my projects as I’m working. She’s such a sweet, pretty girl! I decided to nestle the photo in with the pots, but I wanted to draw a little more attention to the photo, so I added a Die Cut frame as a layer behind the photo. Oh, I forgot to mention that before I adhered everything down, I did add white splatters to the background using Dylusions White Linen Mist. I was very impressed with this mist! It stayed very much true to color which is awesome, because most white mists I’ve tried dry translucent. I also added my journaling using my We R Memory Keepers Typecast Typewriter before adhering anything to the background. I’m still so in love with that typewriter! It’s the 2nd most used tool in my craft room [only 2nd in line to my Cricut]. Now you can take a look at my process video which includes a Cricut Design Space tutorial. Have you visited the new Cut Shoppe Store? You really need to! All of the cut files now come in SVG format, which means no more slicing the cut files apart for us Cricut users! We can just ungroup and move along our merry way! YAY!! This blog post contains affiliate links. This means I will receive a commission (at no cost to you) from products purchased through those links. Hey friends! I’m so excited to be joining the Altenew Live Your Dream Scrapbook Collection Blog Hop! If you started the blog hop from the beginning then you would have come from Laurie Willison’s Blog. If you’ve started here, WELCOME! I’ll have a link to the next blog at the bottom of my post so you’ll still be able to make your way around the entire blog hop. This Live Your Dream Collection is GORGEOUS! It’s so gorgeous that I found myself really wanting to hoard the whole thing! HA! I really love the wide variety of projects that you can create with this collection. It is a bright and elegant line that you really can use to document any occasion. From the little daily moments, you want to remember forever to bigger milestones like parties and birthdays. All of the products in this collection are very versatile and you can use them for many different projects such as 12×12 layouts, pocket scrapbooking, cards, home decor, and much more. I took the Patterned Paper with the rainbow watercolor stripes and cut the blue, green and orange stripes from the paper. I tore each of the stripes in half and stacked the pieces vertically down the center of the white cardstock background. I then went through the Chipboard Stickers and Cardstock Die Cuts and chose the embellishments that matched the green, blue & orange patterned paper strips. I wanted to add a little more visual interest to the background so I grabbed watercolors from my stash and added watercolor behind each of the strips. I then added machine stitching in coordinating colors to each of the patterned paper strips. Then I moved on to adhering everything down. I printed my journaling, cut it in strips and added a line of journaling to each cluster on the layout. Now you can take a look at how this layout came together from beginning to end. For my second project, I started with a white cardstock base. I used the Summer Vibes Cut File from The Cut Shoppe to cut palm leaves from one of the beautiful Patterned Papers from the Live Your Dream Collection. I positioned the palm leaves on the left side of the layout and placed my photo in the center of the cut files. I used multiple Clear Stickers for this layout, but I wanted to use them as die cuts rather than a sticker. I adhered the clear stickers to scrap pieces of white cardstock and fussy cut them out. This way the clear stickers will stay true to their color and I’m able to move them around on my background easily. I grabbed the Altenew Watercolor Dots Stamp Set and a pink spray mist from my stash and added a messy dot background to the white cardstock. I love the added interest the stamping brings to the background. Once the mist was dry, I used my We R Memory Keepers Typecast Typewriter to add a few lines of journaling to the layout. I then brought all of the pieces back onto the background. I adhered down the patterned paper palm leaves, added the Clear Stickers and a few of the Chipboard Stickers also. For the title “Summer Memories”, I used a combo of the Black Puffy Alpha Stickers and one of the Chipboard Pieces. Here’s the process video showing how this layout came together. To celebrate this release, Altenew is giving away a $50 gift certificate to 6 lucky winners! Please leave a comment on the Altenew Card Blog and/or Altenew Scrapbook Blog by February 28, 2019 for a chance to win. 6 winners will be announced on the Altenew blogs on March 3, 2019. Altenew has also kindly offered for me to give away a $30 Altenew gift certificate! All you need to do to enter the giveaway on my blog is to leave a comment on this blog post by March 2, 2019. (To leave a comment, head to the top of my blog & click on the number to the right of the blog post title.) I will be announcing the winner of the $30 gift certificate on my blog on March 3, 2019, so be sure to check back to see if you were the winner! I want to give a huge THANKS to Altenew for asking me to participate with this crazy talented group of hoppers! I have no doubt that you are finding inspiration as you’re making your way through and your next stop is Erum Tasneem. This blog post contains affiliate links. This means I will receive a commission (at no cost to you) from products purchased from those links. Below is a complete list of blog hoppers and you can also find a complete list on the Altenew Scrapbook Blog.